Like many of Anni Albers’s woven pieces, the 1941 hardware necklace series she made with former student Alex Reed was informed by her travels throughout South America. Reflecting on the incorporation of natural materials in ancient jewelry discovered in a tomb near Oaxaca, Mexico, Albers explained, “The art of Monte Alban had given us the freedom to see things detached from their use, as pure materials, worth being turned into precious objects.” By separating form from function, Albers and Reed created innovative designs using common objects. 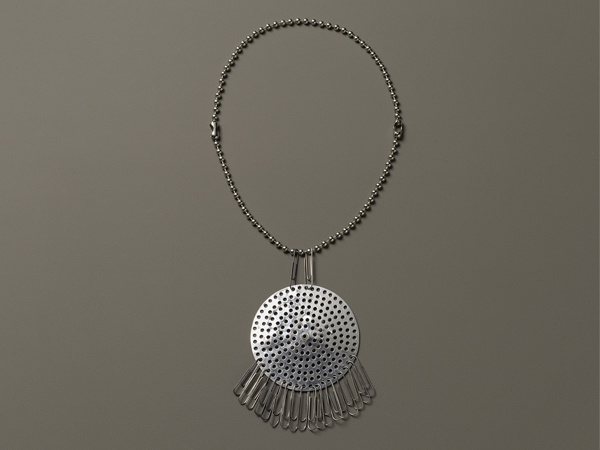 Composed of materials found in five and dime stores, the drain and paperclip necklace features a large, circular sink strainer hung by an industrial-looking chain, with paperclips hung decoratively from the pendant. Ruark’s strong reaction to the hardware necklaces reveals a familiar narrative about how jewelry can and has functioned—as a gift whose inherent value lies in its material worth and/or a symbol of power or dominance over the wearer/receiver. His reactionary point of view was not, however, shared by all: The art world condemned Ruark for not recognizing the “advanced thinking” of Albers and Reed, an innovative approach to jewelry that was appreciated in an earlier and unexpected location, the Boston Sunday Post. By pretending the sink strainer could be returned to its original function, the Boston Post, like Ruark, rejected the transformative work of Albers and Reed, insisting the reader recognize and identify with the original purpose of the found objects before they were upcycled. But instead of interpreting their lack of material value as a weakness, the Home Life feature positioned it as a strength—“[it] costs practically nothing!” Thus the image conjured of a housewife removing her necklace to use it as a strainer while washing dishes becomes rather subversive in relation to popular notions of jewelry and value. While Albers and Reed focused solely on the formal properties of materials to transform common objects into precious objects, the language of functionality was reasserted as one of the main avenues through which their jewelry was interpreted, appreciated, and ultimately valued. Anni Albers, speech to the Black Mountain Women’s Club on March 25, 1942. Robert C. Ruark, “It’s Art Baby,” Philadelphia Evening Bulletin, September 27, 1946. “[Ruark] did not show the customary respect for the advanced thinking of Anni Albers, Sandy Calder, Alex Reed, et al,” in author unknown, “Flat on His Pendant,” Art Digest (October 1, 1946). “Come Out of the Kitchen, Jewelry!” Boston Post, August 3, 1941. Marilyn Zapf is a writer and curator interested in craft and (de)/industrialization. Zapf is the assistant director at the Center for Craft, Creativity & Design, a founding member of the international experimental history of design collective, Fig. 9, and holds an MA in the history of design from the Royal College of Art.